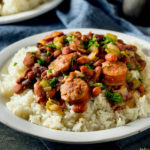 This Instant Pot Red Beans and Rice recipe will bring you all of the memories of the classic New Orleans meal, in a fraction of the time. When you ask someone what are some of the best New Orleans meals, you can be sure that red beans and rice will be on top of the list. Yes, you will probably get the answers of gumbo and jambalaya as well. However, if you are looking for a true, authentic, Creole meal from the Bayou, you have to give red beans and rice a try. So how did red beans and rice become so popular? Although the answer has been much debated over the years, there is definitely a common thought to this classic dish. Red beans, in general, have been a staple in New Orleans since anyone can remember. 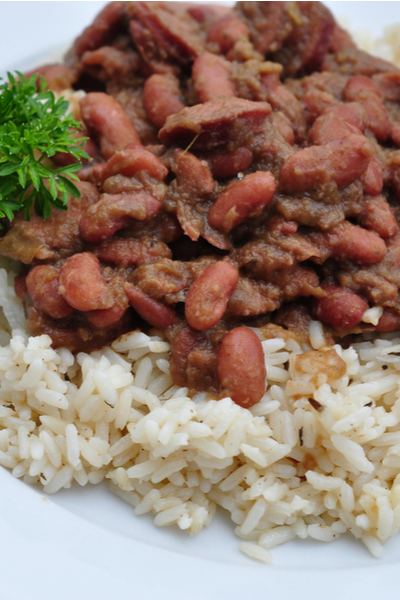 Over the years, many Creole and Cajun dishes used kidney beans as the base of their dish. They were both economical, and hearty. When cooked all day in a simmering pot, kidney beans became creamy and held the flavors of the prepared dish perfectly. History has it that red beans and rice originated out of necessity. First of all, the dish was typically served in the common household on Mondays. That was because Monday was considered cleaning and laundry day. Because these chores were so laborious, the meal for that evening needed to be easy to prepare. That is where the red beans became the star of the show. The pot of beans would be put on in the morning and allowed to simmer all day. This allowed enough time for other chores to be done without constant attention to the stove. But the best part of all, the ham hock from Sunday’s dinner would be used to flavor the dish. For the best texture, be sure to soak your beans before adding them to the Instant Pot. By dinner time, the red beans had cooked down to a beautiful creamy consistency and the remnants of the smoked ham flavored the entire dish. If you are wondering if kidney beans and red beans are the same, the answer is no. They actually are two different legumes, but can often be used interchangeably in some recipes. 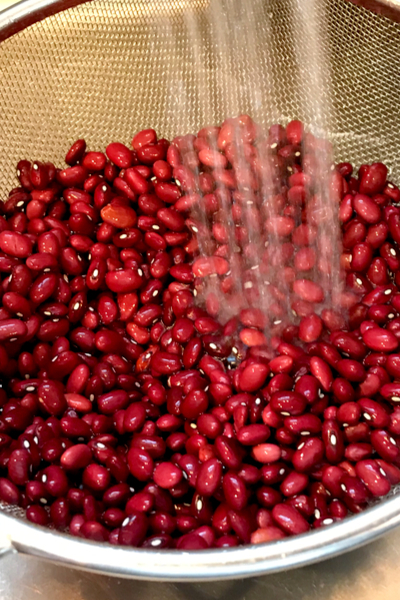 Kidney beans are large and are named for their shape. They hold up well in the cooking process and are used in many chili and Mexican vegetarian recipes. On the contrary, red beans are smaller in size and cook faster than kidney beans. They are the preferred bean in Creole cuisine. You can typically find red beans in most grocery stores. The package will indicate Small Red Beans or Coloradas Pequenas. The most common brand is Goyas. 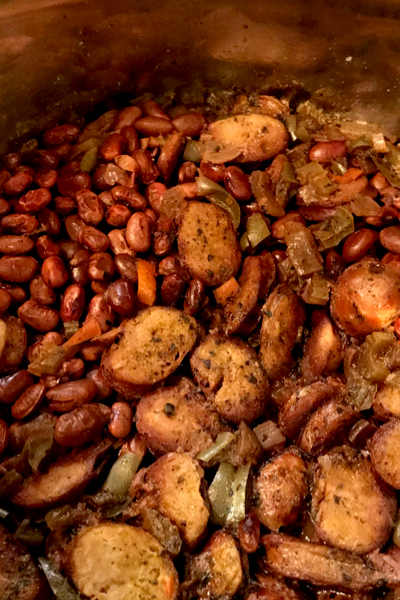 Because this traditional meal takes hours to simmer on the stove, I knew that it was a perfect recipe to convert to Instant Pot Red Beans and Rice. One of the best features of the Instant Pot Pressure Cooker is that it can transition meals that typically take hours and make them in a fraction of the time. When I first made Instant Red Beans and Rice I was amazed! It brought me back to memories of sitting on the balcony of New Orleans enjoying this delicious meal. Add the sausage back into the pot and simmer until thickened. Since then, I have made it with using both dried and soaked beans. I definitely find that the texture is better when using soaked beans. 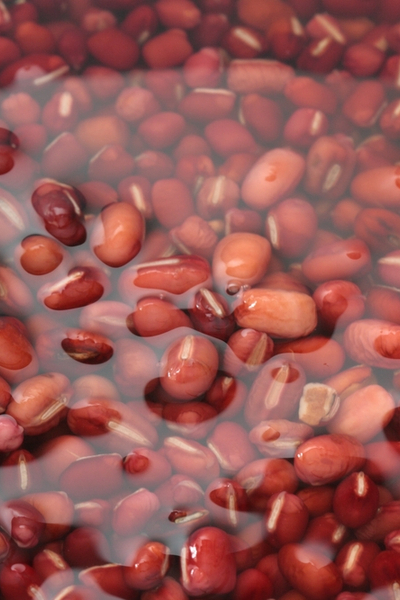 It doesn’t matter if you soak the beans overnight or use the quick-soak method. Either way the Instant Pot Red Beans and Rice come out perfect. So perfect in fact, that my friend who is a long time native of New Orleans absolutely raves about this recipe. And she has now bought an Instant Pot of her own just to make this exact recipe. And to make sure you serve it over the perfect white rice, be sure to follow our Instant Pot White Rice recipe. Classic New Orleans style Red Beans and Rice recipe made even better in the Instant Pot. Push sauté on the Instant Pot. Once the display reads HOT add the oil to inner pot. Add andouille sausage, and cook until browned, about 5 to 8 minutes. Remove the browned sausage with a slotted spoon and set aside. Add onion, bell pepper, and celery and sauté for 4-5 minutes. Add the garlic and continue to sauté for 1 minute. Push Cancel. Add thyme, cayenne pepper, salt, black pepper and stir to coat. Add a little broth to the Instant Pot and deglaze the bottom. 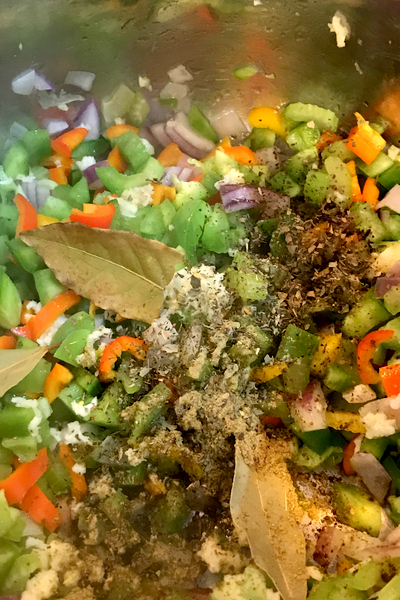 Stir in remaining broth, bay leaves, red beans, and ham hock. Close the Instant Pot and place the valve in the sealing position. Pressure cook/Manual on HIGH pressure for 30 minutes. Once cooking time expires, allow for a natural pressure release (NPR). Once the pin drops carefully open the Instant Pot. Remove the ham hock, chop into bite-size pieces and set aside. Remove 1 cup of beans, and mash with a potato masher or fork. Return diced ham, mashed beans and andouille sausage to the pot and stir well. Place the Instant Pot on the sauté mode and allow the mixture to thicken for about 5 minutes, stirring frequently. Optional: Garnish with parsley, green onions, jalapenos and serve with hot sauce. Serve over cooked rice.